With last week’s death of Jeremiah, the sky seems to be the limit for Bruce and Selena going into “Pena Dura.” Yet there is still much work for him Gordon to do to keep Gotham safe, and Gordon’s potentially rekindled relationship with Barbara (more on that towards the end of this review) is going to complicate matters. With any luck, Gordon and Bruce will now be able to focus on keeping Riddler in line. “Pena Dura” opens with Gordon and Harvey tracking down the guy who sold the RPG, courtesy of Barbara’s tip from the end of last week. As they try to get the info, they are interrupted by Gordon’s war buddy Eduardo Dorrance and his Delta Force, who save our heroes from a gruesome end. His mandate: to restore order to Gotham, something that perturbs Gordon given that it took a lot of death for the government to act. I really like the way McKenzie plays this scene because it brings Gordon’s sense of morality to the forefront. Gordon leaves Harvey to hold down the Fort while he and Dorrance go to question Nygma. Meanwhile, against Alfred’s counsel, Bruce wants to talk to Selena, who is being celebrated at the club as the executioner of Jeremiah, about the supposedly late criminal essentially forcing her into killing him. While it can be argued Bruce is blinded by young love, I don’t like how he always seems to take two steps forward and one step back. Back at Nygma’s hideout, our wayward former CSI is trying to figure out the Riddler’s reason for killing everybody at the Haven when Dorrance and Gordon show up to arrest him. Unfortunately for them, Nygma had a pressure-plated IED connected to his heart rate (yep). 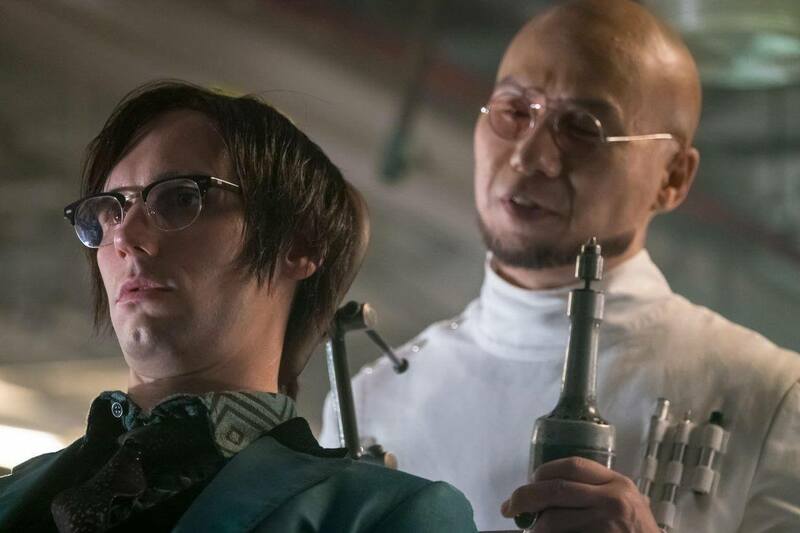 Finally, it looks as Nygma’s storyline is about to come to become prominent as the rest of Gotham City (especially Penguin, whose understated performance in the scene speaks to the relationship between the two villains throughout the show) discovers that Nygma was responsible. At the same time, Gordon, who freed Dorrance from the bomb, gives him the rundown of what they are up against using the map from the premiere, making mention of Scarecrow. We then see that someone has caught Nygma and has hooked him up to a car battery, which shows him some things he had been missing, particularly Penguin’s effort to fix his former friend. Nygma doesn’t want to remember and begs to be stabbed or shot – anything to avoid another shock. When they try to shock him again, the car blows up, which allows Nygma to escape and confront Penguin. Gordon and the GCPD get a tip about Nygma’s whereabouts, and Gordon sends Harvey and Dorrance to apprehend him. I like how Gordon knows he’s sidelining Harvey and wants to rectify that. “Pena Dura” then gives us a callback to the pilot, as Selina tells Bruce they are not the same. Then we head back to City Hall, where Penguin and Nygma hash things out. I’m not sure why, but I got echoes of the final Clark/Lex scene in Smallville while watching this scene, as the two Gotham villains promise to be upfront with another in the future – the difference from Smallville being that, for now, these two are ostensibly on the same side, with Penguin pointing to Hugo Strange as the person responsible for Nygma’s enigmatic nights. As Dorrance and Harvey converge on City Hall, Penguin, of course, attempts to throw Nygma under the bus, but he escapes. Penguin then tries to call their bluff, as he did a couple of weeks ago, except this time the GCPD has the army on their side. As this is going on, Nygma makes it to Barbara and asks her to help him find Strange. I love Cory Michael Smith’s performance here, as it shows the deep relationships all these villains have, and how they know what the other is capable of. Nygma then confronts Strange, who confirms he’s being controlled. In what initially seems like a misdirect solely to get the drop on his assailant, Strange says he’ll write it down. Instead, the deranged doctor knocks Nygma out and attempts to reboot the chip that is controlling him. “Pena Dura” goes back to the GCPD, where we get what I feel is one of the standout scenes of the season. 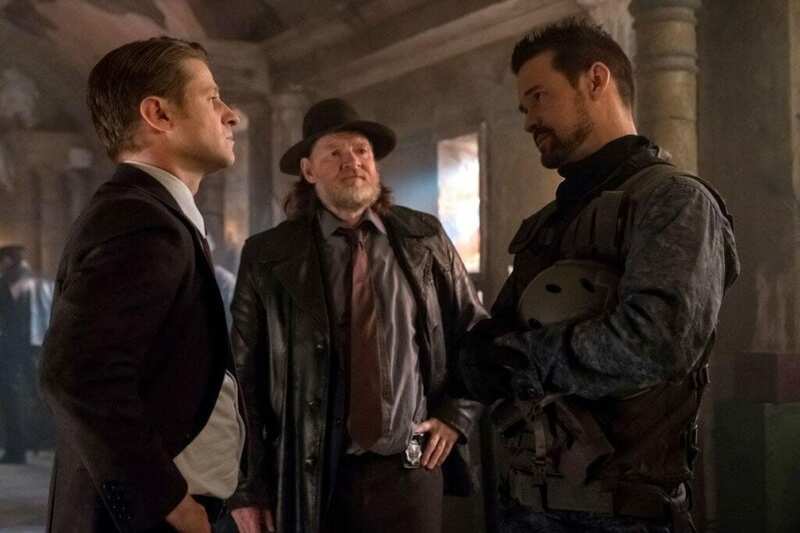 Bruce comes to the precinct to see Gordon; instead, he finds Harvey, whom he asks whether they’ll make it out of this one piece. Harvey tells him to focus on what he can do and not worry about what he can’t, using old cases files as an example. These were things he used to have to deal with, but now he relishes it, as it gives his life focus. Immediately after, Bruce pulls a, well, Batman and disappears, with Harvey commenting on how fast he is. As we approach the climax of the episode, we get two big reveals. The first is that Dorrance and the government are behind Nygma’s brain chip, with the former (and, by extension, the latter) are giving Gordon the option of killing Nygma or becoming an enemy himself, in a scene that to me echoes the pilot, with Gordon once again facing a moral quandary. Luckily, Gordon has learned enough from the Sofia Falcone fiasco that he knows exactly what to do; he doesn’t kill Nygma and manages to get away. However, Nygma, now under Dorrance’s control, is sent after Gordon. In the second twist of the night, we see that rumors of Jeremiah’s death had been greatly exaggerated, as he had orchestrated his death to make Selena think she’d succeeded. He then tells a doctor all the good news he’s heard from Ecco and then looks at two mysterious figures in the room, remarking how he loves family reunions, which leads me to believe that they are lookalikes of the Waynes to mess with Bruce’s head. Writer Iturri Sosa does a great job with “Pena Dura,” which plays a lot like a mid-season finale – understandably, given the fact that this season was initially ten episodes rather than twelve. Of course, the downside to this is that it makes the Bane story arc a bit rushed. I imagine if they had more time, the Dorrance reveal would’ve taken more than one episode. Despite continual inconsistencies with Bruce’s progression, this is overall great work, particularly when it comes to Harvey’s scene with Bruce. Director Mark Tonderai emphasizes Nygma’s struggle and moves his storyline forward. “Pena Dura” is undoubtedly a season-best performance for Cory Michael Smith, and Donal Logue as well. We’re now heading into the final stretch. With the promise of Dorrance’s transformation into Bane and more mind games from Jeremiah, not to mention Barbara’s life-changing news for Gordon in the next episode (bat in the oven, anyone? ), I’m glad to see Gotham is going to go out with a bang. "Pena Dura" features some excellent character work and performances while advancing Nygma's story, but is marred by some inconsistencies and a rushed feeling with Bane's arc.